SANTA ANA, Calif. (KABC) -- Authorities arrested a man who was caught on camera getting into a violent confrontation with a 7-Eleven employee in Santa Ana in February. Daniel Fine, 41, was arrested around 9 a.m. Tuesday at a sober living facility in the city. He had a $25,000 warrant out for his arrest, authorities said. On Feb. 11, surveillance video from a 7-Eleven showed a man get into an angry confrontation with a store clerk after his card was declined when he was trying to buy candy. The video shows the man, later identified as Fine, swiping his card to buy the candy. The clerk then appears to say the card is declined. 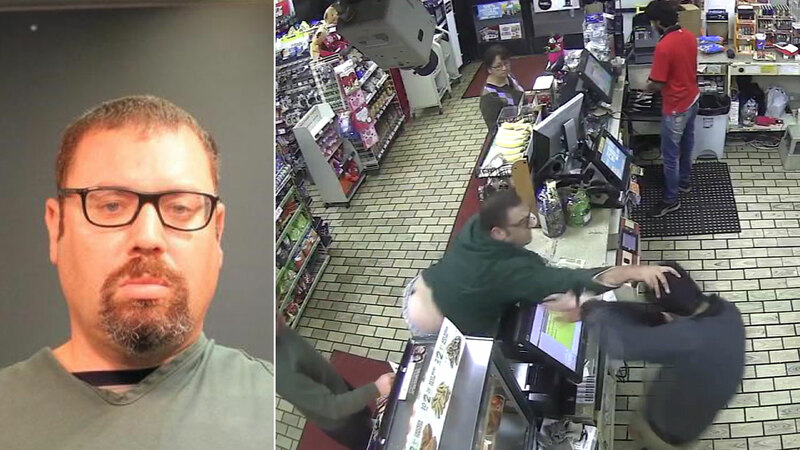 Within seconds, the man grabs the clerk's head, pushing him back. The man then knocks over the register, throws a bunch of bananas, and knocks over the other register on the counter before leaving with another man. Authorities said the damage done to the register system was about $700.